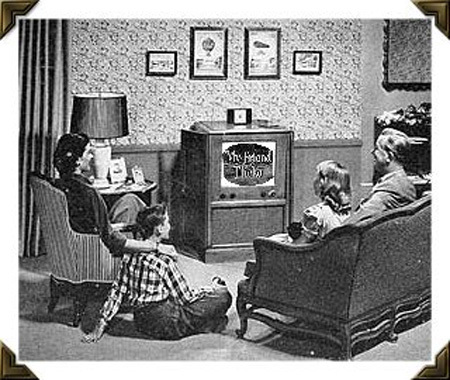 When My Friend Flicka was broadcast into living rooms across the country (and many foreign nations as well), families would gather in the living room for a half-hour of fun and adventure for all ages. 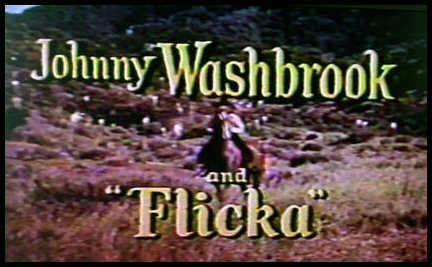 Each episode began with Ken McLaughlin (Johnny Washbrook) riding toward the camera on Flicka. 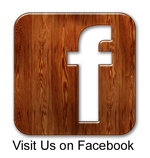 My Friend Flicka television series on You Tube. Below is a complete list of the series’ thirty-nine episodes. Each episode normally took three and a half days to film. The date listed is the original production date, and they are listed here in chronological order by date of production. The episodes were all shown for the first time (in black and white) on Friday evenings, 7:30 to 8PM, on CBS-TV. The episode “Phantom Herd” was chosen for the pilot, and it was the first episode to be broadcast—on February 10, 1956. The series went head-to-head with some strong competition, namely Rin-Tin-Tin. In March the following year, CBS moved the show to Saturdays at 7PM. In April and May of ’57 they broadcast it on Sundays at 6PM, and June through August they showed it on Wednesdays at 7:30PM. In September of 1957, NBC picked up the series and began showing the color versions. They aired the show on Sundays at 6:30PM through December. They moved it to 7PM in January of 1958, where it stayed until they showed the series for the last time on May 18th. It went to be replayed on all the major networks over the years, and on the Disney Channel as well. Director or Photography LLOYD AHERN, A.S.C. Editorial Supervisor ART SEID, A.C.E. PLOT: Ken is forced to let an armed outlaw ride Flicka to his hideout. The man threatens to kill Flicka if Ken reveals the truth to the authorities. Director of Photography, CLARK RAMSEY, A.S.C. PLOT: Sheepherders move into the valley, they and the cattle ranchers feud over rights to the grazing land, and Rob is accused of poisoning a water hole during the ordeal. Director of Photography KARL STRUSS, A.S.C. PLOT: Ken and Flicka help a disabled boy overcome his fear of horses with a young colt. PLOT: An Army sergeant who served with Rob is troubled over the fate of his horse. 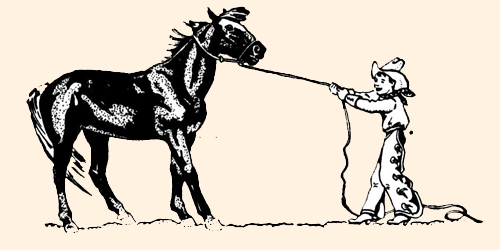 The horse is destined to be put down and the sergeant cannot prove his ownership, so Ken and Rob lend their help. PLOT: Ken is stalked by a wild cougar after he is thrown off of Flicka and cannot walk. PLOT: In his escape from the law, an escaped convict takes Ken hostage. When the sheriff arrives, the fugitive offers to trade Ken’s life for his own freedom. PLOT: Some suspicious strangers offer to buy Flicka and after Ken refuses to sell her, she disappears from her stall. PLOT: Rob McLaughlin and a rival rancher both try to capture a beautiful wild stallion, and Ken agrees to let his father take Flicka along to help catch the horse. PLOT: An Indian mother turns her sick baby over to Ken for treatment by a doctor, and an unscrupulous Indian agent wants to arrest Ken’s father for the family’s interference in Indian affairs. Director of Photography CLARK RAMSEY, A.S.C. PLOT: Flicka helps a captured fugitive escape from jail, and some of the townspeople mistakenly think that Ken was behind it, since she will mind only him. Sound Editor GENE ELIOT, M.P.S.E. PLOT: Flicka is put into a competition for a silver saddle, and Ken is suspected of letting a rival horse loose so that Flicka can win. PLOT: Rob McLaughlin plans to sell the Goose Bar Ranch after his entire herd of horses runs away to join a wild stallion. Teleplay by NAT TANCHUCK & ART BROWNE, JR. PLOT: A spoiled boy--the son of a friend of Rob--visits the Goose Bar Ranch and gets in big trouble when an old mine caves in. Story by NAT TANCHUCK & ART BROWNE, JR. PLOT: Ken and Gus decide to go prospect for gold and neglect their chores at the ranch. Rob is irate, and in trying to accomplish all the chores by himself, he breaks his leg. PLOT: A construction crew reopen a mine, but while doing so block the way to grazing land and contaminate the local water supply. Editorial Supervisor, ART SEID, A.C.E. Film Editor OTTO W. MEYER, A.C.E. PLOT: A ghostly night rider appears in the area. Ken and Flicka pick up his trail, and end up solving a 10-year-old mystery. PLOT: An Ohio family headed for Oregon take shelter with the McLaughlins when the man’s horse runs away. Ken and Flicka set out to track down the runaway horse, and the head of the family finds out what he’s in for. PLOT: Ken’s father and the other ranchers are in a conflict with nesters, but Ken makes friends with one of their youngsters. PLOT: Ken deals with a powerful black stallion with kindness, while the trainer it attacked thinks fear is the only way to train the animal. PLOT: Flicka runs away to join Rebel, a wild horse that Rob had been trying to break. Meanwhile, the wild horse is mistaken for an albino killer. PLOT: An old photographer attempts to photograph a herd of wild horses. After saving the man from being killed in a stampede, Rob suspects the man of being a thief. Story by NAT TANCHUCK and ART BROWN, JR.
Film Editor OTTO MEYER, A.C.E. PLOT: A neighbor decides to get rid of a dog because he objects to his neice’s affection for it. Ken and Flicka step in when the little girl runs away with the dog and the dog is threatened by coyotes. PLOT: Future President Theodore Roosevelt comes to town and intervenes in a range war between local ranchers and a cattle baron. PLOT: Ken pitches in and helps his mother Nell make preparations for welcoming a visiting countess, and he also teaches some men a lesson about their horse. Director of Photography KARL STURSS, A.S.C. PLOT: An Indian, Thundercloud, runs off with his little grandson Silver Fawn to keep him out of the white school. He treats Flicka after an accident, and an Indian agent is hot on his trail. PLOT: Ken hides Flicka in an abandoned barn so he won’t have to turn her out onto the range. Ken is unaware that the building has been sold, along with everything within. PLOT: Ken and his mother Nell are along on the ranch when an escaped convict shows up and takes over the house to hide out from the law. PLOT: Ken finds a puppy in one of his rabbit traps, and it upsets the whole McLaughlin household. PLOT: Rob competes in a bout with the wrestling star of a traveling medicine show. Ken, needing money for the ranch foreman, puts Flicka up as a bet on the match. PLOT: Prejudiced townsfolk are antagonistic toward a young Indian who begins treating Nell McLaughlin, and they try to stop him. PLOT: Rob is seriously considering enlisting to go back into the Army after visiting an old Army friend, and Gus has plenty of reason for trying to dissuade him. Sound Editor GLEN ELIOT, MP.S.E. PLOT: Ken meets an elderly woman who acts strangely, and he thinks she may be a witch. She turns out to be a former circus performer who lost her son when he was thrown from a horse long ago, and she blames herself for the fatal accident. PLOT: Ken runs away from home and soon regrets it. He comes across two very unhappy orphans who long to have a family of their own. 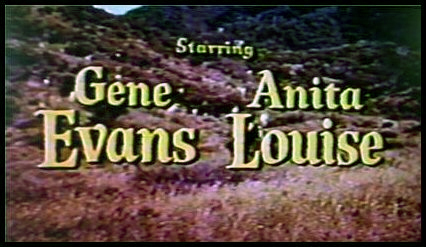 PLOT: A prize bull and a little girl both arrive at the Goose Bar Ranch, and the girl learns the unpredictability of the animal. Editor Supervisor ART SEID, A.C.E. PLOT: Rob buys a horse with a Chinese brand on it. He finds out the markings translate to “Evil comes to him who owns me.” Many believe that the curse is the cause of mishaps happening during a dig for much-needed water. PLOT: Rob is training show horse when it flees, frightened by a fire. 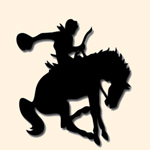 He and Ken follow the horse into rugged country, trying to get to the horse before a gun-wielding cowhand does. 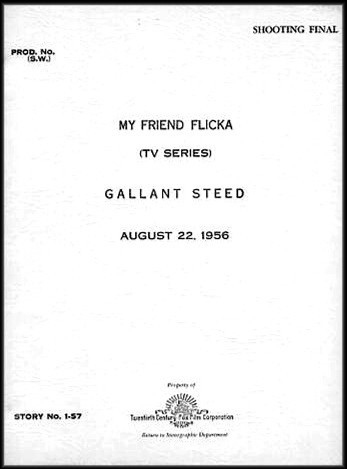 There were several episodes that were in the mill for production when the series abruptly ended, as evidenced by this script for an episode titled “Gallant Steed” that had been slated for final shooting on August 22, 1956. NOTE: Some original scripts from this television series are available for viewing at The University of California, Los Angeles (UCLA), in its Performing Arts Special Collections. They are a part of non-circulating collection of script materials for motion picture and television productions, 1955-1956, donated by Connie McGuigan in 1981 (Identifier: 709416). 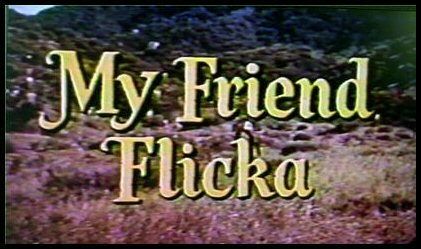 DVD copies of the My Friend Flicka television series can often be found on Internet web sites if you search something like "my friend flicka tv dvd" in the search field. While we cannot recommend any particular person or business for these, they are probably your only option for obtaining a personal set for home viewing.